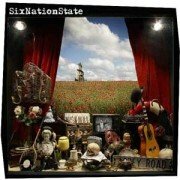 SixNationState debut album out 24th September! Hot from supporting The Holloways on their Summer Seaside Tour and playing a live session on Dermot O’Leary’s Radio 2 show, SixNationState release their eponymously titled debut album on 24th September 2007. Their debut album is a flamboyant and audacious collection of the effortless and the sublime; from the roar of ‘I Hate The Summer’, to the pure heart skipping joy of ‘We Could Be Happy’, the ska-fuelled, ‘Up & Down’ and onwards to ‘Keep Dancing’ that will make your head bop like Churchill’s dog. The album shouts of the creativity and sheer glee of being in SixNationState, a mood which similarly sums up their revelatory live shows which are fast winning a nation of fans; their gloriously infectious melodies backed up by the spectacle of five showmen having the time of their lives on stage as noted recently by The Fly who called the band “full blooded and vivacious”. 8. Where Are You Now? You can pre-order the CD at www.recordstore.co.uk and it’s also available in all good record stores. For those of you that download it can be pre-ordered at www.7digital.com. SixNationState will release their eponymously titled debut album on 24th September 2007.